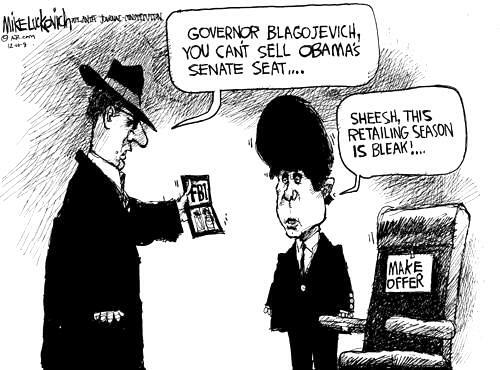 The media are in a feeding frenzy over the Blago scandal...and they're doing their best to smear Obama at the same time! [T]his morning on MSNBC there was a lengthy discussion of Obama's involvement in Blagojevich's corruption. Of course, there was no evidence of any involvement on Obama's part. Nor, despite this being a news channel, was there any original reporting of any kind whatsoever. There was, however, a ton of time spent criticizing the Obama campaign's PR strategy with regard to this issue -- the suggestion being that had Obama adopted a better PR strategy, then people wouldn't be on television making evidence-free guilt-by-association accusations against him. This struck me as odd. The people making the accusations kept acknowledging that they had no evidence. One might think that communicating to television personalities the fact that there was no evidence of wrongdoing on Obama's part would constitute a good PR strategy. Given that they knew there was no evidence of wrongdoing, they should have ceased implying that there was wrongdoing. But they didn't do that at all. Not, I would submit, because of any failings on Obama's part, but because Joe Scarborough, Mika Brzezinski, John Heileman, Mark Halperin, and Pat Buchanan don't care at all about the accuracy of the impression their coverage gives. "Morning Joe" is a pain. His program is atrocious. Amazing that the same network can carry Olbermann, Maddow and 'Morning Joe' Scarborough. What ever happened to the question of whether there was foul play when the intern was found dead in his office when he was in Congress? I like the discussion that examine the numbnuts fervor to impeach Blago so quickly, which is justified, over a minor action compared to actions perpetrated by Bush on Cheney. Well said. Funny how those actions are accepted by so many in this country. There is something to be said for a misinforming media. I don't wish being mugged on anyone, but better Mika than an innocent person. A little karma coming home early. Isn't it normal, necessary, and natural for a president-elect who is a Senator to discuss his vacant senate seat with the governor who will be appointing the person to fill the vacancy? 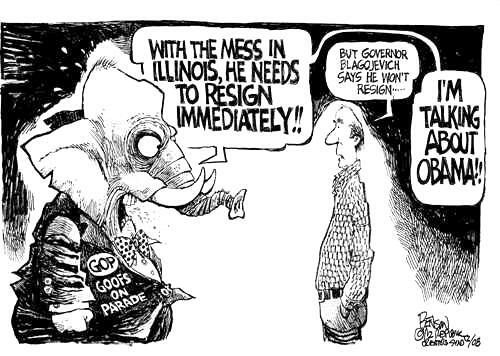 Just because that governor happens to be a crook doesn't mean the people who have daily conversations with him or her are also crooks. Isn't it normal, necessary, and natural for any government official, including the president-elect, to obey a gag order or request regarding any investigation into a governor's behavior and activities? It's Obama's duty and responsibility to obey Fitzgerald's request that he not respond to media questions about the case. What would be the media's reaction if Obama said, "No, I'm going to behave like the outgoing president and put myself above the law and discuss whatever I please, when I please, with whom I please, and you can all just stuff it up your fat asses because I'm soon to be the PREZ! Now watch me shoot this basket!" The media operate 24/7 now and they're all in a feeding frenzy. They don't report the news anymore. They simply make it up. Not only do they make it up, they make it up to please their corporate bosses. Corporations that drool over war profits. No wonder they pick on a person who believes in diplomacy rather than 'bombing people back into the stone age'. The shame is, the number of people who can not seem to employ critical thinking. The media need to go off the air now and then, like they used to. The first time I remember TV stations being on the air for 24 hours was when JFK was assassinated. It wasn't until there were cable/satellite channels that 24/7 became the norm. Over the air broadcast stations were the last to take on the 24/7 burden; many not until the 1990's. 1990's? Really? I didn't realize that. How did people live without all those paid programs, ie, unending commercials? Blago is low hanging fruit and exposes the hypocrisy and complicity of politicians ,by not prosecuting the Bush Regime and provides easy distraction for the complicit media .